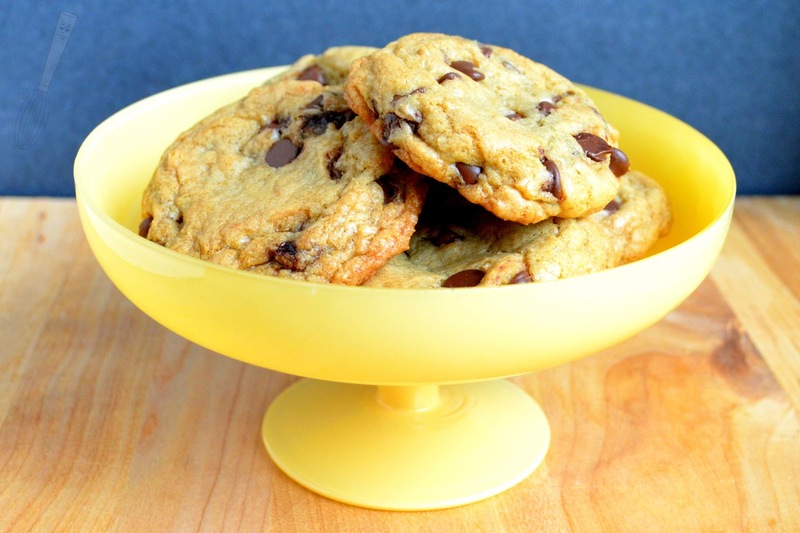 Chocolate chip cookies are a classic treat and I'm pretty sure I don't know of anyone who doesn't love them. 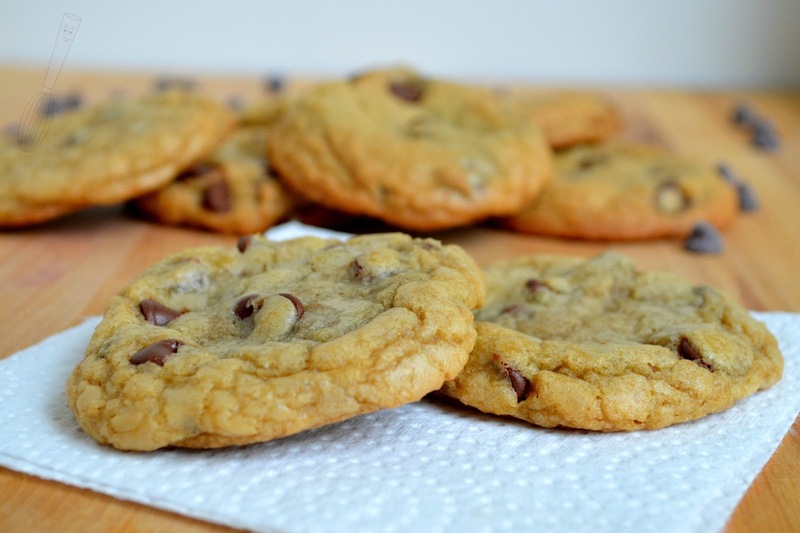 Sometimes I made traditional chocolate chip cookies but most of the time I can't bring myself to do it. I like to change them up a bit in one way or another. I've tried lots of ways, adding nuts, adding multiple types of chips, filling them with something like caramel or peanut butter, or stirring in some candies. I decided this time that a nice fudge filling would be delicious and I'm a pretty big fan of these. A lot of people are thinking of easy desserts to make for July 4th, this weekend, or just a random cookout. These are easy to make ahead, even a day or two because the chocolate filling will stay nice and moist. What I love about these is that they are a little crunchy on the edges but so soft and chocolatey in the middle. Molten chocolate cakes are one of my favorite desserts and these remind me of those a little bit with the warm chocolate middle right after they come out of the oven. 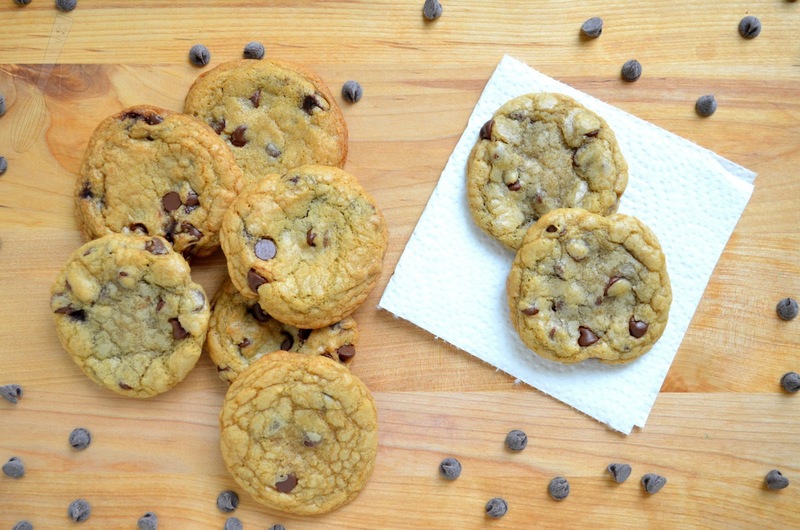 You could use mini chocolate chips and that may make wrapping the cookies a little easier because the big chocolate chips are just that, big chocolate chips. Consequently wrapping the dough around the fudge pieces can be a little interesting. It's important to make sure that the fudge piece is covered completely before they are baked. I had 3 of them that leaked a little, but not much and it's not as if the cookies weren't edible :). I'm all about eating the ones that I don't want to share with other people. 1. In the bowl of a mixer, blend together the 4 tablespoons butter and next three ingredients until mixed. Add the flour and cocoa powder, stir until blended. Stir in the chopped chocolate chips. Scoop the mixture into 2 teaspoon portions (not heaping) onto a piece of parchment or greased foil on a cookie sheet. Place in freezer for at least 45 minutes. 2. Meanwhile, using a mixer, blend together the melted butter, sugars, and vanilla until uniform in color. Mix in egg until blended. Add the salt, baking soda, and flour and stir until mixed. Stir in chocolate chips. Refrigerate mixture until the other dough is ready to come out of the freezer. 3. Preheat oven to 350F. Scoop 2 tablespoons of the chocolate chip cookie dough out and wrap it around a frozen fudge piece so that the fudge piece is completely covered, place on a greased cookie sheet (or lined with a Silpat). Repeat for each fudge piece using 2 tablespoons of dough to wrap about them. (I fit 6 cookies per cookie sheet). 4. 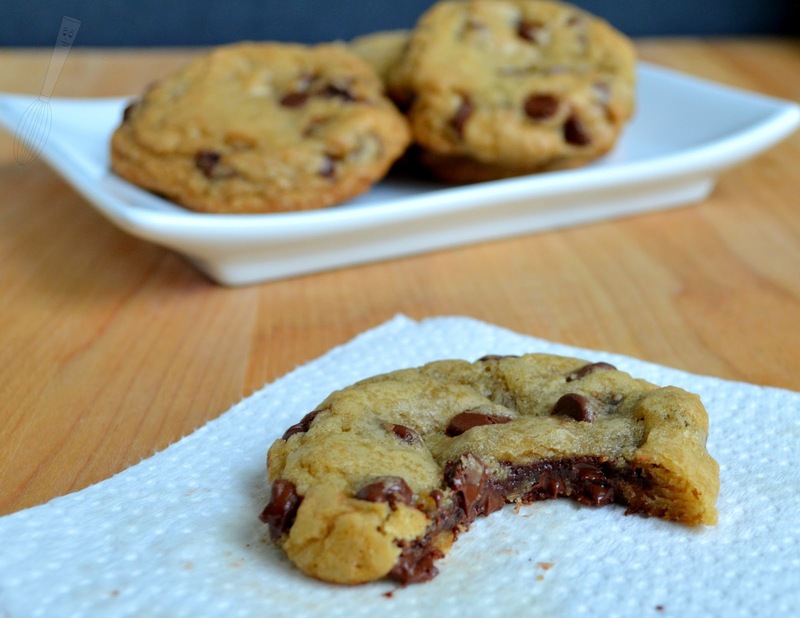 Bake for 12-14 minutes or until just golden brown around the bottom edges of the cookies. Cool on pan for 1-2 minutes, then cool completely on a wire rack.